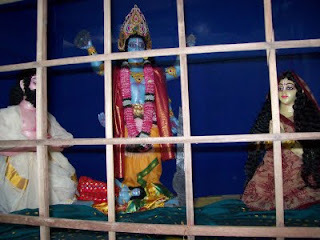 Sri Krishna was born in prison at midnight while it rained and thundered, and streaks of lightning illuminated the sky. 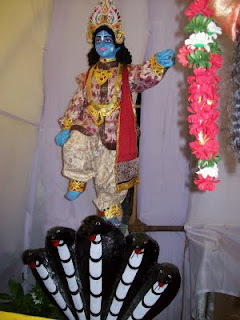 And so on 'Sri Krishna Jayanthi' or Janamashtami we worship him at midnight or as close to midnight as we can. And insist it will rain on that night. But yesterday it did not, and we are still sweltering in this unusual August heat. Krishna is worshipped in his many forms, from that of an innocent baby to an adult who can preach the Gita. Children just love him as the mischievous child Krishna who with his friends ran around stealing butter and curds from the pots of the gopis, and teasing them. 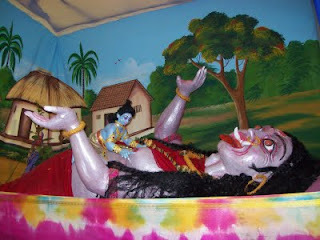 There are many songs that recount his mischievous deeds, and children made up as little Krishna dance to these songs. South Indian homes decorate the front yards and floors of their homes with kolams for all festivals and celebrations. 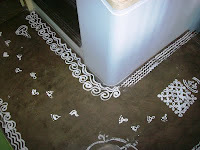 While powder is used for the ground outside, wet rice paste is used to draw the kolams inside. 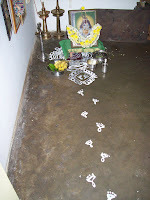 For Krishna Jayanthi it is customary to draw the little feet of Baby Krishna going from the front door to the place where the pooja is to be conducted. It looks beautiful and children love to place their feet on the drawn feet and pretend they are Krishna. It was only recently I learnt why we draw the feet of little Krishna. Running away after breaking pots and stealing the butter and curds, Little Krishna used to leave these tiny tell tale foot prints, it is said. And we replicate them in our homes. 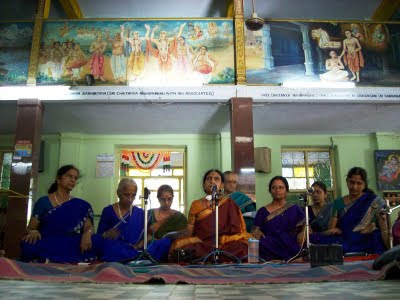 Here is a very brief video - when we (Gangamritham)sang at Gaudiya Math temple on August 6. There is always a fascination with numbers we are associated with, especially one’s birth date numbers. We look for ‘lucky’ numbers into our roll numbers in class, the number on the hall ticket, numbers on our addresses and telephones – (though today’s ten digit numbers leave me fatigued, with trying to memorise them in the right order). Mathematicians find intriguing mysteries and even romance in all numbers. One of our friends is a Professor in Maths, and can do all sorts of sums and calculations in his head. He is totally engrossed in his subject. I once asked him what he did for relaxation. He said “I read books.” “Oh, what books, fiction, or non-fiction?” I asked. He answered, “Books on Maths”. Car number plates are endlessly fascinating. When we travel by road, while the rest of the family looks at the make of the car and records the speed it is travelling at, I look at the number plates, and invariably end up adding the digits. I am not alone in this interest in number plates. One of my favourite stories is that of the mathematical genius Srinivasa Ramanujan and his mentor G. H. Hardy. Ramanujan, ill equipped to cope with the vagaries of the inclement British weather, fell ill in England. Hardy visited him in hospital, taking a ride in a taxicab. The number of the taxi was, according to Hardy, uninteresting – 1729. Ramanujan disagreed with him and said that it was on the other hand a very interesting number. “It is the smallest number expressible as the sum of two cubes in two different ways." To most laymen (including me) this would be Greek and Latin, but to those number lovers it was sheer poetry. I can only imagine the following minutes when the two would have discussed and dissected the magic of the number. "Every positive integer is one of Ramanujan's personal friends. ", said J. E. Littlewood, Hardy’s collaborator, after hearing this incident. 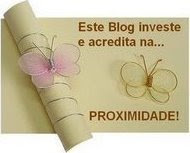 This morning I received a mail from Indiblogger, saying that my blog was ranked 77th. The ranking did not affect me one way or the other, but the number did. I was tickled, because it was my roll number in college, and later my son’s rank in the Joint Entrance exam of the IIT. You can see the widget here on the right side. However, I was happy to see Maiji outranked me - her blog is ranked 58th! The following piece by writer Charukesi appeared in the Friday supplement of The Hindu, last week in the city edition, and this week in the other editions in Tamilnadu state. In appreciation of Muthusamy Iyer’s skill, Paramacharya conferred on him the title Gajaaranya Dravida Kavimani. It was 1924, when Sri Chandrasekharendra Saraswati visited the house of Muthusamy Iyer, a contemporary of Tamil scholar and orator Ki.Va. 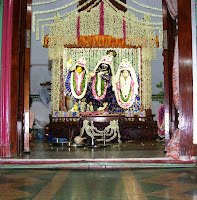 Jagannathan, at Aranganathapuram in Tirukattupalli, Thanjavur district. Swamigal accepted ‘biksha’ a t his residence and presented him with a Shanmuga rudraksham. “Earlier in 1920, when my grandfather recited Sankara Sadguru Aatrupadai” in Tamil, Mahaswamigal offered him a silk shawl, in appreciation of his poetic excellence,” said Prof. Muthukrishnan. When Muthusamy Iyer turned 60, it was celebration time. Muthusamy Iyer composed ‘Arul Vendar Paa’ using all the sixty names of the Tamil years from Prabhava to Akshaya and recited in the presence of Mahaswamigal and he was blessed with a Rudraksha Mala strung in gold. Muthusamy Iyer’s 125th birth anniversary is being observed by his family now and this writer happened to meet his grandson, the recently retired Professor Muthukrishnan of Anna University. He was awarded the gold medal for obtaining first rank in Madurai Tamizh Sangam examinations and won another at the Presidency College. During his tenure as teacher in Vellore, he composed “Thani Paa Naarpathu” and when he took up the post of Tamil teacher in a school in Madanapalle in Andhra Pradesh, his first work of fiction, “Padmini” was released. This was prescribed as a non-detailed text for the intermediate classes. When Muthusamy was just 30, he did his research on Poruladhikaram in Tholkappiyam. His ‘Thani Paa Kovai’ was released in 1918. In 1932, he composed ‘Anbu Vidu Thoodhu’ on Mahaswamigal. His “Mayuranatha Anthathi” saw the light of the day only in 1942 although he had composed it as far back as 1920. ‘Tiruvallluvar Oruthurai Kovai’ was published in 1950. The book brought out in 1944 during his 60th birthday celebrations, contains congratulatory messages of many Tamizh scholars, writers and poets, many of them in the form of poems, especially by Desikavinayagam Pillai, Suddhananda Bharathiar, Somasundara Bharathiar, advocate and novelist Ka.Si. Venkataramani, Thanigaimani Sengalvaraya Pillai, Srivatsa Somadeva Sarma, Tirupugazhmani Krishnaswami Iyer, Sir P.S. Sivasamy Iyer, Sir C.P. 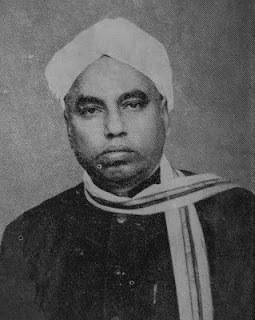 Ramaswamy Iyer, the Raja of Ramnad Raja Rajeswara Sethupathi, A.K. Paranthamanar, popular writer SVV, P.N. Appusamy and nearly fifty teachers and engineers of eminence! What surprises one is the message of Sami Vedachalam (better known as ‘Maraimalai Adigal’). This is in English and not in his favourite Tamil! Thanjai Vetrivel Pathippagam, in deference to the wishes of Muthusamy Iyer’s sons and daughters, had published this book. The Hindu carried the news of his 60th birthday celebrations in its November 5, 1944 issue under ‘Provincial News – Tirukattupalli’, while the Tamizh daily ‘Swadesamitran,’ carried it on the following day, 6th November, 1944. Muthusamy Iyer’s octogenarian son Balakavi Mu. Kothandaraman, now lives in a suburb of Kozhikode, had acquired expertise in reading palm leaf manuscripts and has, like his father’s teacher U.V. Swaminatha Iyer, published many books. When he was serving in the U.V. Swaminatha Iyer Library, International Institute of Tamil Studies and the Institute of Asian Studies, he strove for the preservation and documentation of palm leaf manuscripts opening a department for the purpose. Among his several works in Tamil, the translation of Narayaneeyam in poetic form won him the G. Sankara Kurup ‘Odakkuzhal’ prize. BUT WHERE IS THE AUDIENCE! To take a line out of Edward Lear - it was just as I feared. 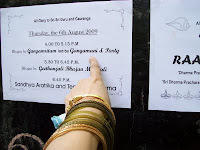 Not a soul to hear us sing at the Sri Gaudiya Math temple, (See last post) even though it was splashed on the noticeboard. Unless you counted the involuntary presence of the Swamijis, and the four bovine creatures belonging to the temple. Even family members, who normally accompany us, were absent on account of the odd time slot – my husband hardly comes to hear us sing, and this time was no exception. Visitors to the temple usually come around 6 pm for the pooja. However Lalitha and Padmini’s father was there with his video camera, as were Vatsala’s mother and daughter, and Meenakshi’s cousins. 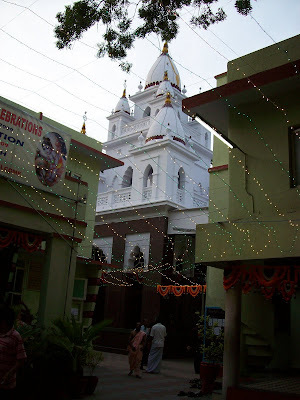 The hall where we sang is part of a building next to the actual temple housing the deity, all within a compound, and had painted depictions of Sri Krishna and Chaitnya Mahaprabhu not only along the interiors but on the ceilings as well. The paucity of audience was compensated for by the mikes – we got six – and our own enthusiasm. We sang for 75 minutes - kirtanas on Lord Krishna and Sri Rama, accompanied by Jwala ( a post graduate student) on the violin and Sri Krishna on the mridangam. Sri Krishna is a high school student and a disciple of veteran Umayalpuram Sivaramakrishnan. Our guru Ganga, despite a fever, led us as competently as usual. 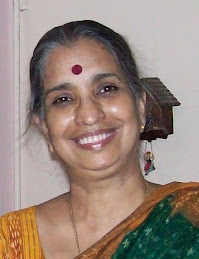 We missed Geetha who has gone to spend time with her little granddaughter. The audience swelled towards the close of our programme, when the members of the next group to sing came in! A video clip of the concert is here. Another big day for Gangamritham! Our group is to sing today at the Sri Gaudiya Math temple of Sri Radha Krishna where the 'Janamshstami' celebrations of Lord Krihna’s birthday are on. 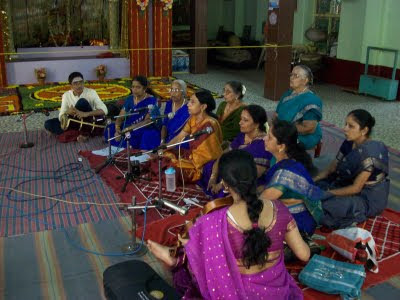 Two weeks of celebrations at the temple, and daily concerts are part of the agenda. Our concert is scheduled to be at 4 pm and to be honest, none of us has any hope of any audience at this unearthly hour – most of the families will be at school or at work! Still we are going to give it the best we have got. The month of aadi in the Thamizh calendar starts mid July , and ushers in a series of festivals, culminating in Diwali, some months later. 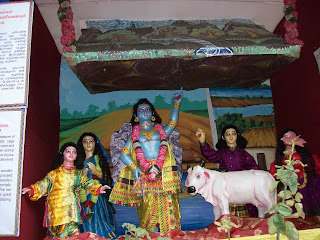 Aadi is a holy month, dedicated to the Gods, and ceremonies like weddings and other festivities are not conducted in this month (maybe in order to not detract from its religious flavour?). 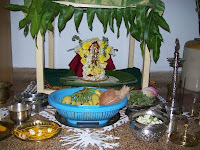 The first of Aadi is considered a festive day, and is celebrated with a feast and a visit to the temple. It has a special significance for newlyweds, but I am not dwelling on it here. This year the first religious festival in Aadi was Varalakshmi Pooja, a pooja for women. This pooja is special because it is performed only in families which have been observing it. To join this fraternity, women may take the pooja from someone already conducting it. 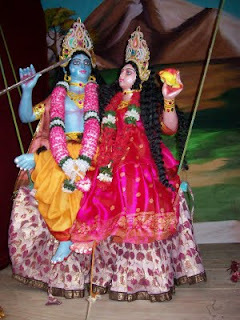 Women perform it with great devotion and fervour, creating the image of the goddess out of a kalasam, decorating it, and placing her in a specially decorated mandapam created for the purpose. Then there is the 'aadi perukku', or 'Pathinettam perukku', on the 18th of Aadi. This is the day when the river Kaveri is in fullest flow after the rains, and rolls merrily down. My mother-in-law, who belonged to the Thanjavur district, the lifeblood of which is the Kaveri, used to tell me that people in the area would go to the banks of the Kaveri to worship her and enjoy the day – a kind of picnic. A meal would be prepared, as offerings to the river goddess, mainly of mixed varieties of rice, - lemon rice, coconut rice, curd rice, and a sweet rice - quick to prepare and eliminating the need for a curry. 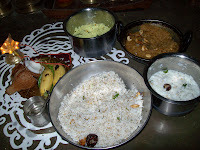 We still follow the system of preparing the offerings, though there is no Kaveri here in Chennai, and enjoy the prasadam. 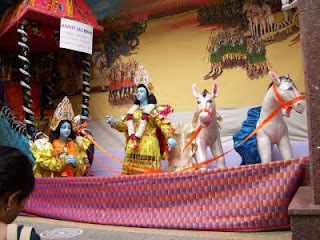 Next on the list is Sri Krishna Jayanthi, which falls this year on August 13, and the series of concerts are part of the two-week celebrations. 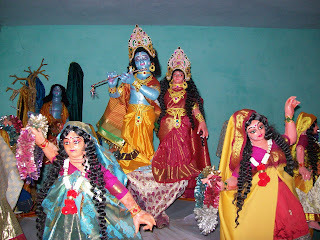 At Sri Gaudiya Math where we are going to sing today, a series of sequences from Lord Krishna’s life are exhibited using practically life-size dolls with real (or what looks like real) hair. Here are some of the scenes. 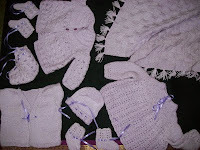 Do you remember the picture of the layette in this blog posted some time ago ? The VIP who my mother knitted it for has made her appearance - my new granddaughter - first child to her parents and second grandchild to us. She is also the first grandchild to her mother’s parents. Though we haven’t seen her yet, we hope to be with her in some weeks’ time. But here we are all excited, conveying the news and receiving good wishes from one and all. There really is something about the arrival of a baby that touches all – everyone wants to know who she looks like, what her name is, what did she weigh, does she cry much, how is the mother, and how does her cousin Nino feel about it! We have seen pictures of her, and yes she looks beautiful, and her name is Samyukta. And so, no, even if she had been born here, she would not have qualified for a gold ring from the Mayor of Chennai.